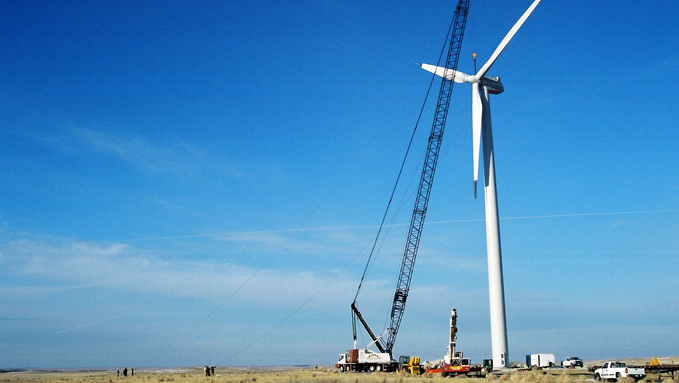 With the help of NativeEnergy, the Rosebud Sioux Reservation installed the nation’s first tribally-owned, large scale wind turbine. The Alex Little Soldier Wind Turbine was built with NativeEnergy’s financial support in the spring of 2003. The turbine is located near the town of Rosebud, on the Rosebud Sioux reservation in south-central South Dakota. Tribal officials saw this first turbine as the start of an economic development initiative that would bring a vital industry to the reservation – a “show horse” with an educational mission. In addition to the support from our customers, the Rosebud single turbine project and plans for the wind farm were funded under a Department of Energy grant and loan from the Rural Utility Service. Disgen, Inc. provided development services. The Alex Little Soldier Wind Turbine is a 750 kilowatt (kW) NEG Micon wind turbine. The turbine stands atop a 170 foot tubular tower and has three blades, spanning a diameter of 150 feet. It begins generating electricity when wind speeds exceed 8 mph. It reaches its maximum 750 kW rating at 31 mph, and shuts down when wind speeds exceed 55 mph. The average wind speed at the site is estimated to be 17.9 mph at a 155 feet above ground, and the turbine produces about 2,300,000 kilowatt hours (kWh) of clean electricity each year, enough to supply about 200 homes. This project is a collaboration among the Rosebud Sioux Tribe, the project developer Disgen, Inc., Intertribal COUP, and customers who purchased NativeEnergy’s Help Build™ carbon offsets. This project was validated using Carbon Neutral Network methodologies.